Agamotto is an entity within the Marvel Universe. He is one of the three powerful entities known as the Vishanti from whom Doctor Strange draws much of his powers and knowledge of magic from. He is generally considered to be benevolent. Agamotto claims that his origins go back to the beginning of Earth. He is a non physical, non corporeal entity that was born from an entity called Oshtur around 10 million years ago. He becomes a magical defender of the Earth dimension and helps protect it early on from Dormammu. In this role as protector of Earth he is sometimes referred to as the first Sorcerer Supreme. At some point Agamotto works with the human sorcerers of Earth to select a single powerful sorcerer to act as the world's Sorcerer Supreme. Agamotto then bestows various magical artifacts to the Sorcerer Supreme. These artifacts include the : Eye of Agamotto, Orb of Agamotto and the Book of the Vishanti. 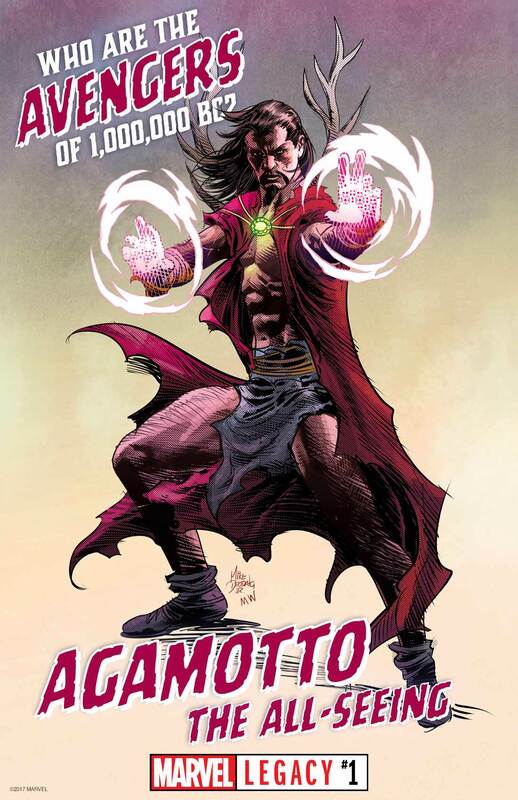 Agamotto is part of the group known as the Vishanti and often appears with the other Vishanti being Hoggoth and Oshtur. Oshtur is the elder goddess of the Earth and the mother of Agamotto. The 3 Vishanti are benevolent omnipotent forces that are often opposes by other powerful entities. The group of entities that counter the Vishanti are the Trinity of Ashes. The Trinity of Ashes is made up of evil entities that includes Griefsavor, Ygmlosvorraich, and Mother of Pain. Very little is known about these other 3 entities. The Vishanti and the Trinity of Ashes face off in a ritualized 5 thousand year war called the War of the Seven Spheres. The power level of Agamotto is extremely high. It is thought that his power is greater than Hoggoth and Oshtur combined even though he is the spawn of Oshtur. He has also been shown dealing with other cosmic entities such as Galactus and Dormammu. Agamotto can take on any appearance and tends to take on something from the mind of those he is meeting. He has appeared as a Lion, Tiger, and as the giant caterpillar from Alice and Wonderland. The personality of Agamotto greatly varies from formal, to informal, to glib, to threatening, to silly, indifferent and even hostile. The varied personality is sometimes thought as testing the Sorcerer Supreme in various guises. Generally Agamotto seems to care about the well being of all universes and for helping the forces of good overcome evil. If he did not then the world would have very quickly been overtaken by Dormammu. Toylab is a member of the Amazon affiliate program and as such is thrilled to bring you these amazing deals on Doctor Strange products through Amazon. Agamotto is mentioned numerous times in Doctor Strange as the first Sorceror Supreme. The Eye of Agamotto which is revealed to be the time infinity stone is also heavily featured. At one point Wu says that Agamotto was the one who created the Eye of Agamotto.